The cabinet reshuffle and the downgrades of the sovereign external ratings have raised political and policy uncertainty. This adversely affects market sentiment and could delay the nascent economic recovery. Recent developments have reinforced South Africa’s vulnerability. Appointment of the new ANC leader in December is critical. A more pragmatic reformist leader and clear future policies will support confidence. In March this year President Zuma surprised financial markets by replacing the well-respected minister of finance Gordhan in a cabinet reshuffle. His successor, Malusi Gigaba, is known to be a Zuma loyalist. It raised the question of whether South Africa’s current path of fiscal prudence will be continued. All rating agencies provided an answer by downgrading the sovereign external ratings. S&P and Fitch downgraded the rating one notch to a sub-investment grade. Moody’s also downgraded the rating one notch, but South Africa still maintains an investment grade. The reasons for the downgrades are indeed concerns about continuity of fiscal consolidation and debt sustainability, as well as concerns about governance and policymaking at public institutions. South Africa seemed to be on track. Like many countries it was hit by the global financial crisis in 2008 and the decline in commodity prices that began in 2011-2012. This resulted in weak economic performance, and large fiscal deficits since 2008 and a sharp rise in public debt. In 2016 total public debt amounted to approximately 50% of GDP in comparison to 27% of GDP in 2007. Faced with increasing borrowing costs and a depreciating exchange rate the authorities took actions to reduce the fiscal deficit from 2014 onwards. The increase in government spending was constrained and the interest rate was raised. Despite this, both monetary and fiscal policy continued to be accommodative. The interest rate was not raised to extreme high levels and fiscal deficits remained relatively high due to the sluggish economic growth. The downgrades and the cabinet reshuffle could delay the economic recovery as it aggravates the already weak confidence in the country. 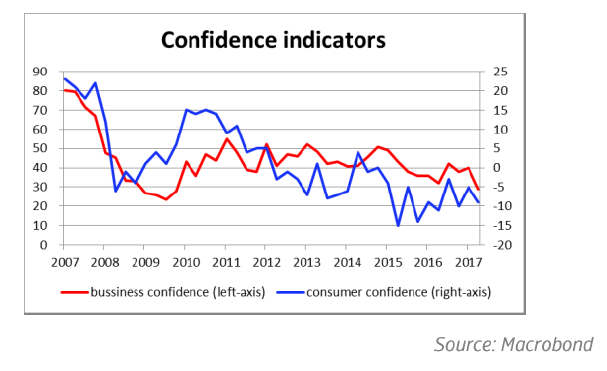 Both consumer and business confidence indicators have been declining in recent quarters and are at their lowest levels since the global financial crisis. In the first quarter of 2017 GDP contracted 0.7%, following a contraction of 0.3% in the last quarter of 2016. There was a strong recovery in agriculture and the mining sector profited from higher commodity prices, but activity in other sectors declined. It resulted in the first recession since 2009. In 2016 overall economic growth was only 0.3% as the economy was hit by a severe drought and low mineral prices. Besides, domestic demand was weak hampered by an unfavourable combination of high unemployment, high inflation, high household debt and high interest rates. Still, due to the recovery in agriculture and mineral prices, economic growth of 1.3% is expected for this year. However, the downside risks for this forecast are that weak confidence and deteriorated market sentiment could have a negative impact on the economy. Despite the 2017 recovery, South Africa is not out of the woods. For several years now economic performance has been weak in South Africa. External shocks have hit the country, but also structural constraints like infrastructure bottlenecks, labour market rigidities, widespread poverty and inequality are hindering economic growth. Internal divisions within the ANC have risen after the cabinet reshuffle end March and the subsequent downgrades by the external rating agencies. The position of President Zuma was already weak due to corruption scandals. Now continuation of his presidency until the next presidential elections in 2019 is highly unlikely. But he refuses to resign. In December this year the next leader of the ANC will be appointed. Currently, the candidates for ANC leadership are Nkosazana Dlamini-Zuma, former chair of the African Union Commission and ex-wife of Zuma, and Cyril Ramaphosa, deputy leader of the ANC and the country. President Zuma, and his loyalists, are in favour of his ex-wife, who probably will support Zuma’s fight against future corruption charges. But, the ANC is divided and, moreover, public support for the ANC has decreased due to the recent developments. On one side are the Zuma-loyalists, who are keen to secure their patronage network and at the other Zuma-opponents seeking a more pragmatic reformist agenda. Some high-profile ANC members, the South African Communist Party and the Congress of South African Trade Unions are supporting Ramaphosa. With the ANC being so divided about these two candidates it could also come with the solution of a “compromise” candidate. The appointment of the next ANC leader is critical. The leader will also become the next president. The election therefore marks an important moment for the future of South Africa. In the run up to the ANC elections uncertainty is expected. This will be exacerbated by populist statements seen in recent weeks like, for example, changing the mandate of the central bank. Due to the political and policy uncertainties confidence is weak and this increases South Africa’s vulnerabilities. 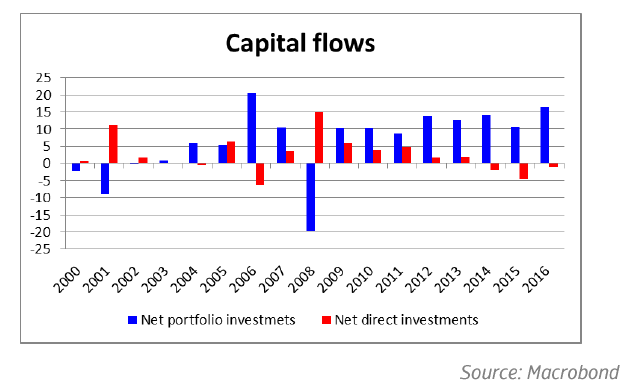 After a sharp decline during the global financial crisis net portfolio inflows have increased sharply in previous years. In 2016 the net portfolio investments were more than double its current account deficit. It covered almost half of its gross external financing requirement, reaching a stunning 439% of its international reserves in 2016. This dependence on portfolio flows makes South Africa highly vulnerable to changes in market sentiment. This kind of investment has a short-term nature and therefore investors can pull out of the market when confidence sours. South Africa needs more foreign direct investments which are a more stable source of financing. But FDI inflows have been declining since 2014 and have been relatively low since 2008. Some of the main issues that are having a negative impact on FDI, especially regarding the mining sector, are policy uncertainly and structural constraints like an unstable power supply. The vulnerability to changes in market sentiment is visible in the exchange rate as well. 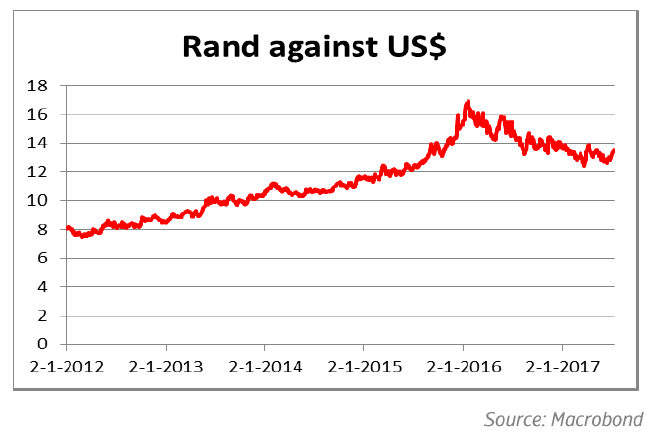 Historically the rand is a volatile currency and it has been depreciating since 2012. To curb inflationary pressures caused by the higher import costs (and higher food prices) support for the currency was required. The South African central bank has been doing this by gradually increasing the interest rate from 2014 to 2016 by 200 basis points to 7%. The higher interest rate worked, it supported the currency. However, deterioration in market sentiment when minister of finance Gordhan was fired and the sovereign external ratings were downgraded ended the strengthening of the rand against the US dollar. Although the currency has since recovered somewhat the current account deficit and policy uncertainty will keep the rand under downward pressure and will create volatility. This might cause a dilemma for the central bank of South Africa. In recent months inflation has declined and is expected to fall within the central bank’s inflation target of 3%-6%. Lower inflation and the weak economic situation create room for the central bank to lower the interest rate in the coming months to support the economy. However, the rand is also supported by high interest rates in South Africa and the search for yield is attracting foreign investors. Therefore, it is necessary to maintain a positive rate differential with the US to attract foreign portfolio investments. If the central bank is considering an interest rate cut it will probably be a small one. The situation also emphasizes the vulnerability to a US interest rate hike, as such an event will also reduce the positive interest differential. Indeed, when the FED announced it was ending its very accommodative monetary policy it had a large impact on the exchange rate of the rand. Back then South Africa was labelled as one of the fragile five emerging markets vulnerable to changes in capital flows due to its current account deficit and dependency on portfolio investments. Notwithstanding the vulnerabilities and challenges, South Africa has a number of strengths. The high level of portfolio investments are definitely a vulnerability, but also represents the well-developed domestic financial markets. The banking sector is sound and well-capitalized. Overall, the macroeconomic framework is well-developed, adherence to the constitution and the rule of law are key pillars of strength of institutions (in comparison to other emerging markets institutions are stronger) and the central bank is independent. Although the public debt has increased sharply and is high, the foreign currency debt is low, mitigating the exchange rate risk. The impact of the downgrades and the cabinet reshuffle on the economy is not clear yet. Critical for South Africa is the December election. A more pragmatic reformist leader and clear future policies will support confidence. South Africa has a longstanding vulnerability to changes in market sentiment, but the recent political and policy uncertainties have increased this vulnerability, They are affecting confidence and could delay the nascent economic recovery.